Ridgefield players celebrate following their 3-2 win over Darien in the Class L volleyball championship Thursday at Fairfield Warde High School. FAIRFIELD — All Hail the 3-Peat. 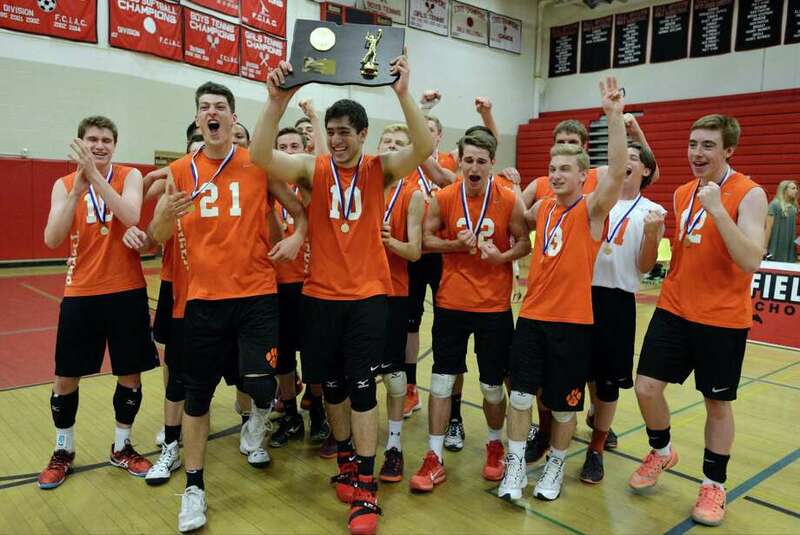 The Ridgefield High School boys volleyball program continued its iron grip on the Class L state championship Thursday night. The Tigers rallied from a 2-1 deficit to defeat archrival Darien High, 18-25, 25-19, 22-25, 25-22, 15-9 before a passionate crowd at the Fairfield Warde High gymnasium. The 2016 edition was the third straight L title for Ridgefield, which downed Darien both in 2016 and 2015 while sweeping Southington in 2014. For No. 5 seed Ridgefield (21-4), the fourth time proved to be the charm in conquering No. 2 seed Darien (24-2). Darien beat Ridgefield twice in the regular season as well as in the 2016 FCIAC Championship final. Things didn’t look well for the Tigers after Darien won Games 1 and 3 to build a 2-1 edge. So with Ridgefield coach Lidania Cibere wearing her lucky Ridgefield orange dress along with the high heel shoes she’s worn the entire state tournament, the Tigers went to work. Their depth allowed 6-foot-7 junior hitter Nicholas Laudati (35 kills) to rest on the bench while others performed back row duties. Ridgefield’s versatility in hitters didn’t allow Darien’s defense to focus in one area. A big hero for Ridgefield was junior setter Henrik Liapunov. He played the entire way despite a sprained ankle suffered in Ridgefield’s semifinal round triumph over East Hartford. It’s all about being together for Ridgefield. This rivalry between Ridgefield and Darien will continue hot and heavy in 2017. Only Hayden Nackley will graduate from this Darien squad. Darien junior captains Alex Preston (30 kills) and Tim Herget (18 kills) along with freshman setter Tyler Herget (57 assists) fought to the final point. Records: Ridgefield 21-4; Darien 24-2. Highlights: R - Ridgefield has won the last three Class L state crowns. D - Alex Preston 30 kills, 5 service points. Tim Herget 18 kills, 8 service points. Sean McKay 6 kills, 2 blocks. Tyler Herget 57 assists.